Vieni a soggiornare nella nostra casa sull'albero - Camere con vista! Situato in un quartiere boscoso nel Poconos, la "casa sull'albero" è una casa unica, alta e spaziosa con 4 camere da letto e 4 bagni. La struttura della casa è sfoggiata con una splendida cucina aperta e una grande sala immersa nel sole, che vanta un camino a tre lati, finestre chalet e viste a sud di 30 miglia verso sud, tra cui la collina Blue Mountain Ski, il Little Gap e oltre ! Cucina dispone di elettrodomestici in acciaio inossidabile e frigo vino. Un AC senza conduttore da 36.000 BTU al piano superiore mantiene la casa confortevolmente fresca. Sempre ventilato, c'è un grande mazzo per rilassarsi e godersi i pasti all'aperto con vista o avvolti dalle cime degli alberi. La camera da letto principale dispone di un bagno privato con vasca da giardino e doccia separata. Il livello inferiore ha la quarta camera da letto con TV montata, di fronte alla sala giochi per bambini o ospiti che desiderano uno spazio più privato. La sala giochi offre mini ping pong, biliardino, freccette, popcorn e macchine per il gumball. Con 3 piani separati, c'è spazio per tutti. Grande cortile privato circondato da una foresta dispone di amaca e altri posti a sedere sotto un baldacchino di alberi. Altri servizi includono tv a schermo piatto e wifi, garage e vialetto circolare. 15 minuti da sci, rafting, mountain bike, trekking e 30 minuti ai pittoreschi negozi e ristoranti di Jim Thorpe. Accesso alla piscina, al campo da tennis e da basket attraverso l'HOA a meno di un miglio di distanza. We were very satisfied with the overall stay. The house is beautiful and situated in a quiet neighborhood. The keycode locks on the doors were easy to handle and the house was clean with great carpets and hard wood floors. The small gift basket with white wine was a nice touch and my kids loved the snacks it provided. The rooms were small but we were there for sleep only and they were adequate. The game room downstairs was where the kids spent playing foosball and table tennis. The dart game on the wall was also a plus. The adults spent most of the time in the kitchen and dining room area. It was nicely stocked with all the necessary kitchenware and utensils. The house had good heat system and we were never cold. The first night at the house, we went out to the local Shoprite about 15 minutes away and stocked up on drinks, chips and breakfast items. That store is supposed to be the largest Shoprite store in the U.S. It was huge! Overall, the house was nicely kept and we had all we need to have a nice vacation. Kelly was very helpful with directions and instructions were kept detailed before our visit so no further questions were needed after we arrived. We would definitely keep this house as an option for the future. Thank you so much James. It was a pleasure to host you and your family. Thanks for taking such great care of our home and we’re glad you enjoyed your stay. We hope you’ll stay again! It was such a pleasure to host you and your friends! Thank you for taking such great care of our house (and leaving it so spotless!) and being such a joy to work with on your reservation. We do hope you will stay again! We had been planning a trip amongst a group of friends for sometime and were looking for a nice house in the Poconos that we could spend some time. Kelly and Joe's home far and away exceeded our expectations. The homeowners were kind, helpful, and easy to communicate with. We had several activities planned during our time here but made the decision to forego them all together and instead spent our time at the house relaxing on the deck and enjoying the vista's that can be seen from the deck and living room. The kitchen and furnishings were better then we could have hoped for. If you are looking for a nice place to spend a relaxing vacation in the mountains then this home will not disappoint. Thanks so much for the great review. We’re so happy you enjoyed our home and we appreciate you taking the time to post your review. We feel similarly that once we’re at the house, enjoying the view and atmosphere, we’re less inclined to go out! You and your friends were wonderful guests-thank you for taking such good care of our home; we enjoyed hosting you and would be delighted to have you stay again! The only place to stay in Poconos! We had such an amazing time at this this gorgeous home! Kelly was always reachable and quick to respond. A lovely gift basket complete with a bottle of wine welcomes you in the kitchen - a very inviting, and warm touch. This is the only home I will ever stay in anytime I am visiting The Poconos. Kelly - thanks so much for sharing your home with us. See you soon again! It was such a pleasure to rent our home to you and your family! We are so happy that you enjoyed your stay and appreciate so much that you took such great care of our home. You were wonderful to work with from start to finish on this reservation and we will be delighted to host you any time! Kelly and Joe were extremely helpful and gracious for our entire stay. They were on hand via text, email and phone from the beginning of the booking until the end of our reservation. The house was great! I can't say enough, beautiful views, big fridge, nice fire place. Really happy with everything. All 8 of us had a great weekend and I thank them immensely. It was such a pleasure to welcome you and your friends to our home. We’re so happy you enjoyed your stay! Thank you so very much for treating our home with such care and for your warm and friendly interactions in the planning process for your stay. We hope you’ll stay again! Wishing you a wonderful and happy 2018! My family and I loved the property! Kelly and Joe were amazing! The gift basket was such a nice touch! We would definitely stay again. One suggestion, I would remove the tv from the game room, put it I kids room and take kids tv and put in living room on top floor. 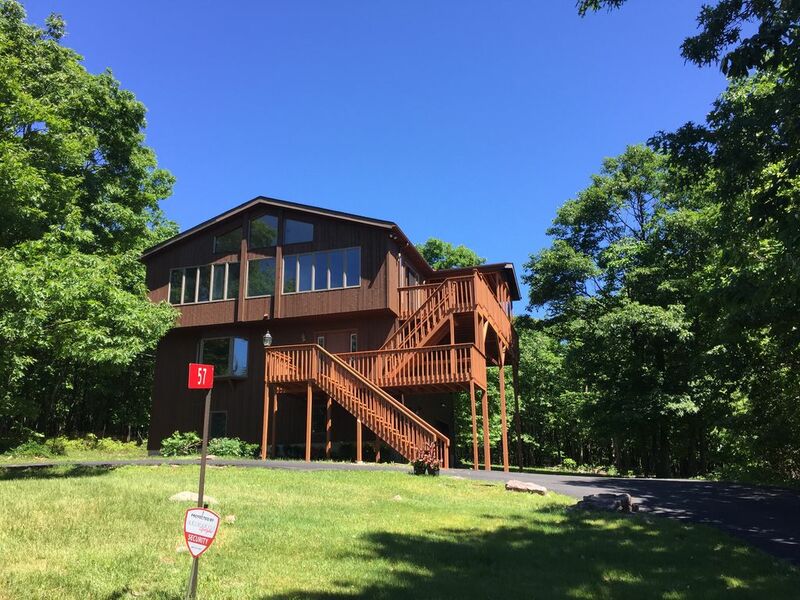 Overall this was the best house we have visited in the Pocono area! Thank you for allowing us to stay at your home! Thank you Jeanine! We were so happy to host you and your family in our home! We're glad to know that you liked the gift basket and enjoyed your stay! Thank you for taking such good care of our home and for your kind words here. We'll keep in mind your suggestion about the tvs and we'd be delighted to host you again!